1. Cook the noodles according to pack instructions, drain and cool with cold running water. Meanwhile, thickly shred the cavolo nero. 2. Heat 1 tsp oil in a wok and fry the tofu with the star anise for 3 minutes or until the tofu is golden. Set aside, discarding the star anise then repeat with the mushrooms and salad onions using 1 tsp oil. 3. Heat the remaining oil and sizzle the ginger and chilli flakes. Add the cavolo stems, cook for 30 seconds then add the leaves. Return the tofu, mushrooms, onions and noodles to the pan with 2 tbsp water and 2 tsp soy, keeping the heat high until the leaves are wilted and the noodles are hot. Add more water if dry. Sprinkle with soy to serve. 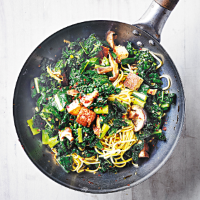 Cook’s tip For a shortcut stir-fry, try adding ½ x 140g pack Waitrose Soy & Ginger Sauce With Garlic at the end of cooking. You won’t need to add the fresh ginger or soy sauce.